PM Take Aways from Progressteron	Presentation on Presentations - get ready for your next big presentation. Some tips from Peter Taylor. 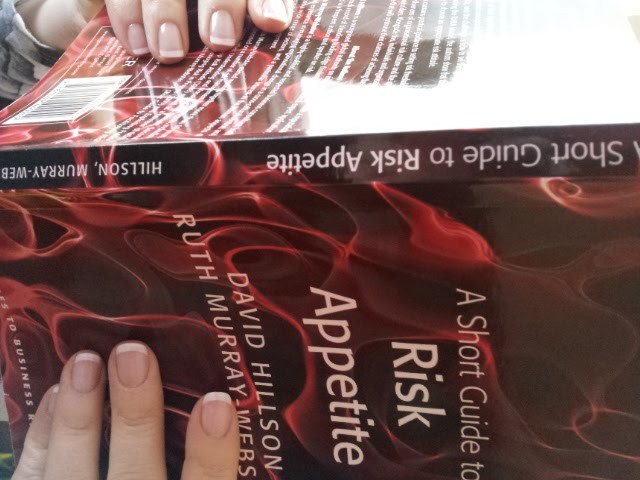 I’ve just finished reading the book by David Hillson and Ruth Murray-Webster “A Short Guide to Risk Appetite”. This post dedicating to all Women around the World. Wish you to make good decisions in risky and important situations! Happy International Women Day! Ruth Murray-Webster is a highly-qualified and respected business consultant, with broad experience in managing organizational change in a cross-cultural context and across a wide range of sectors, and a particular interest in the human aspects of effective change management. I really like her concept of a hamburger expressed in a book from the same series: “A Short Guide to Facilitating Risk Management” written together with Penny Pullan (another great expert on risk management). 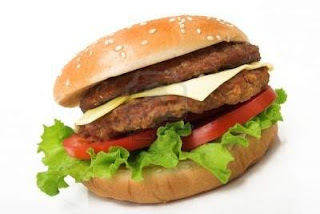 They propose a burger model for facilitating the risk process where the meat represents the work content (the actual risks), the bun- facilitation process and some lettuce and slices of tomato represent the knowledge of risk management and the ability to challenge risks. Great risk facilitators stay vegetarian. They focus on the facilitation process and the risk management process, but stay out of the “meat” of the work content. After a short presentation of these two great ladies let’s introduce David Hillson, a recognized global authority on risk management, with a reputation and track record of blending leading-edge thinking with practical expert application. And for me David is the risk management Guru, number one in the World. I can even call him my mentor – have a chance to meet him in person on a few occasions and now follow him virtually (webinars, presentations, interviews) and through reading his books. What I like the best about him is his talent to talk about complicated concepts in a simple way – watch the interview recording and you will understand what I mean. When I teach risk management I always quote David or present his concepts. What do you think about this risk definition” Great, isn’t it? I always try to encourage people to indentify positive and negative risks, as they both matter and need to be managed proactively. I’ve used the word try because have failed on a few occasions. And without his risk meta language I would not be able to explain the difference between risk, risk source and risk impact, as it’s easy to confuse risk with cause or effect. Example: The project is using the new technology (cause/fact). This means we might not be able to assess the project duration properly (uncertainty/ risk). The project would/could take longer than the Sponsor expects (effect/possible result). Helpful? I think so, especially for less experience PMs. I have seen many risk registers with wrongly defined risks, for sure these people did not know the risk meta language. 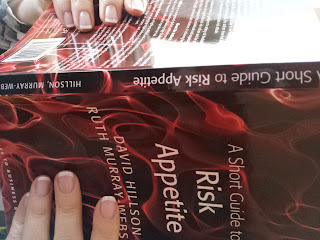 Let’s come back to the “A Short Guide to Risk Appetite” book, which I recommend for everyone, not only for Project Managers. We all need to answer: How much risk should we take? and other risky questions in our lives. We can apply the same concept of decision taking, no matter if this is: My decision, the Operational Decision, the Strategic Decision or the Community Decision. In the book a practical RARA Model has been presented, which explains the complementary and crucial roles of Risk Appetite and Risk Attitude. When I started reading this book I got lost with all these regulators, standard bodies’, professional associations’ and consultants’ definitions of risk appetite and other risk related concepts. Believe me, most of them very confusing. Almost wanted to give up, but because trust David decided to continue. And do not regret it, as the authors walked me through all these complicated concepts in a simple manner, giving so many examples, and in the end of the journey I was able to explain it myself. And what”s the most important I not only know the definitions but also understand how to use it in my life, so my next risky decisionwill be taken with the support of RARA. How much risk do we usually like to take?= Risk propensity (skłonność in Polish) – tendency of an individual to take risk in general / Risk culture – shared beliefs, values and knowledge of a group about risk. How much risk do we want to take? = Risk appetite – the tendency of an individual or group to take risk in a given situation. How much risk can we take? = Risk capacity – ability of an entity to bear risk, quantified against objectives. Risk thresholds = quantified measures that represent upper and lower limits of acceptable uncertainty against each objectives. Hopefully this book will help you to make good decisions in risky and important situations!